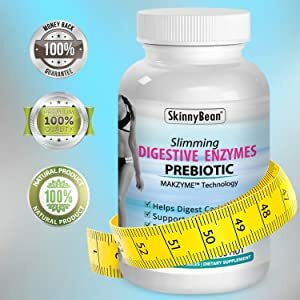 The best digestive enzyme supplement probiotic capsules prebiotics for Women prebiotic’s and probiotics supplements for natural weight loss. In addition to superstar enzymes like lactase from fungi, bromelain from pineapple, and papain from papaya, Digestive Probiotics help promote a healthy gut and cultivate an environment within which your digestive enzymes can be their most effective. It is a pleasure to share the powerful and meaningful benefits our digestive enzyme could have in your life. It all started with the desire to make people feel good in multiple ways. ❤ You will feel even better from the superb benefits you get from our most advanced formulation. ❤ You will trust in our customer care. ❤ You will feel good knowing when you prioritize your health and beauty with our supplement, a significant percentage of each sale goes to children's healthcare charities. Digestive Enzyme supplements help the body break down proteins, fats, and carbohydrates to assist the body in breaking down and assimilating nutrients to make more energy and give you a healthier life force. This enzymatic formula works is the ultimate aid that boosts the body's ability to digest fats, fiber and protein, as well as cellulose and gluten.The digestive enzymes found in these capsules help break down food and proteins into smaller molecules so that they can be easily carried into the bloodstream. This helps in boosting one’s metabolism for a belly fat busting boost. This supplement can help the body regain the nutrients and enzymes that most people are missing out on due to their lack of raw foods from our diets. One of many Benefits of this digestive enzyme is the way it enhances nutrition absorption. This is done by assisting the body In breaking down difficult proteins and sugars which support digestive health. These factors aid your body's natural weight loss. Makzyme-ProTM Enzyme Blend (Fungal Protease from Aspergillus oryzae, Lactobacillus acidophilus, Lactobacillus casei, Lactobacillus plantarum) 2500 HUT / 400mg, Bromelain 90 GDU, Papain 2670 TU, Fungal Lipase 1500 FIP, Fungal Lactase 600 LACU, Alpha Galactosidase 300 GALU. Other Ingredients: Vegetable Cellulose (veggie capsule), Magnesium Stearate (vegetable source), Silicon Dioxide.